TURQUIE – Aizanoi - A 2,000-year-old skeleton with a mask on its face has been found in the Aizanoi ancient city in Kütahya, during excavations in the area which have been continuing for two years now with new findings emerging. Speaking to Anadolu Agency, excavation group president Pamukkale University Archeology academic Elif Özer said the excavations had been ongoing since 2011, and many findings had been excavated from the area. The skeleton was excavated from the northern part of the necropolis eras. The mask of the skeleton was found along with the face and the body. This mask is thought to have been used in the burial ceremonies in Aizonoi, said Özer. The mask was put on the face of the dead and this might signify the relation of the dead with the ceremony of Dionysos. At the same time, excavations in Rome, Italy also uncovered masks. These masks have been related to ancestor cult, according to Özer. “We are doing research on this issue,” she added. Özer said the information about the findings was yet to be determined, and the masks that had been excavated from the theater area and necropolis area were different. 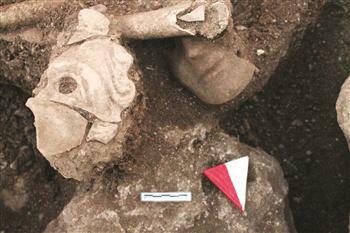 The theater area excavations also revealed Eros masks and Eros sculptures. EL SALVADOR – Cihuatan - At least 160 fragments of sculptures, possibly of jaguars, were discovered by specialists in the archaeological park of Cihuatan, located in central El Salvador, the Culture Secretariat said. The remains come from "five or six feline sculptures," found along with pieces of two censers, the secretariat said in a statement. The fragments were found in a structure built against the perimetric wall of the Cihuatan ceremonial center, a site of Mayan origin located some 36 kilometers (22 miles) from Aguilares, a town north of San Salvador. The sculptures could have been of jaguars, though the fragments do not show the spots characteristic of their skin, FUNDAR archaeologist Paul Amaroli said. "It is estimated that Cihuatan was occupied between 1000 and 1200 A.D., and that its first inhabitants came from central Mexico, where they had abandoned their villages after the Mayan collapse," the secretariat said. PALESTINE – Gaza - St. Hilarion's monastery, a reminder of the time in late antiquity when Christianity was the dominant faith in what is now the Gaza Strip, is one of many archaeological treasures scattered across this coastal territory. But Gaza is one of the most crowded places on earth, and the rapid spread of its urban sprawl is endangering sites spanning 4,500 years, from Bronze Age ramparts to colorful Byzantine mosaics, experts say. Archaeologists, short of funds and unable to find sufficient trained local staff, say they are scrambling to find and protect the monuments. Some are left open to the weather. Others are engulfed by new development projects. Six years on, the ruins of St. Hilarion about 10 kilometers (six miles) southwest of Gaza City illustrate the challenges of saving Gaza's ancient treasures. The two-hectare (five-acre) monastery complex, known in Arabic as Tel Umm Amer, is believed to mark the birthplace of St. Hilarion, a fourth century A.D. Christian monk considered to be one of the founders of monasticism in the Holy Land. The site includes walls and foundations that are the remains of two churches, a cemetery, baths, a baptism hall and mosaic pavements. The ruins were uncovered in 1999, said Nabila Maliha, an archaeologist at Gaza's Ministry of Tourism and Antiquities. Now, local authorities have trouble preserving it. "We lack the capability, the support and the proper materials," she said. DANEMARK – – Bornholm - The first archaeological study conducted by researchers from the Institute of Archaeology, University of Warsaw in Hammershus castle on the island of Bornholm in Denmark resulted in the discovery of medieval Swedish and Danish coins. The castle is one of the largest structures of its kind in Scandinavia and the third most important monument of this category in Denmark. The coins were covered in the oldest part of the building, the so-called Tinghuset - house of the judge. "The finds are consistent with well-known history of the castle and confirm it. Swedish coins clearly testify to the supremacy of the Swedish bishop of Lund, who ordered the construction of the castle in order to facilitate the collection of taxes from the subordinate Bornholm" - told PAP the project leader Janusz Janowski from the 3D Scanners Laboratory of the Institute of Archaeology, University of Warsaw. However, in the last days of the study, archaeologists found the coin of the King of Denmark - Frederick I from 1524. This corresponds to the period when Hammershus belonged to the Danish crown. Among more than 200 discovered objects was also a medieval padlock, which according to archaeologists confirmed that treasures had been kept in the castle. In addition, archaeologists also found a medieval dice, ornamented bone plate and a tile fragment with the presentation of a face, imported from the territory of present-day Germany. "All the objects clearly show the wealth and refined taste of the castle residents" - said Janowski. 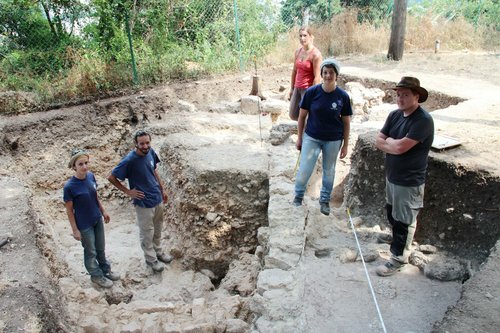 FRANCE - Saint Maur des Fossés - Le service Archéologie du Conseil général vient d’effectuer un diagnostic archéologique à Saint-Maur-des-Fossés. La surface concernée par cette opération est de 6891 m2. La parcelle est située au nord de l’enceinte du XIVe siècle de l’abbaye de Saint-Maur et l’une des tours disparues pourrait y être localisée. L’occupation de ce secteur remonte à la fin du second âge du Fer (à la période gauloise), l’abbaye étant fondée en 641. Des structures périphériques à l’abbaye ou antérieures à la construction de l’enceinte sont probables. Située près de la Marne et d’une ancienne île (île du Couvent), sur l’emplacement supposé d’un ancien bras de Marne (le « Fossé Babolein ») des aménagements liés à l’abbaye (moulins, quais, gords etc…) sont également possibles. 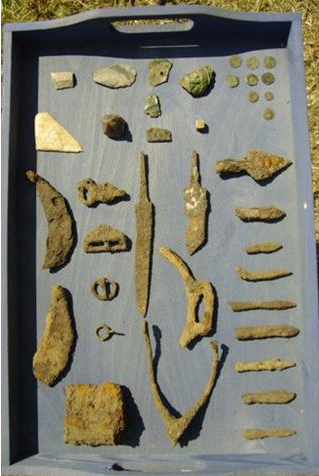 USA – Sandpoint - An archaeological dig conducted ahead of a northern Idaho highway project has uncovered nearly 600,000 artifacts from the late 1800s to early 1900s at Sandpoint’s original town site. 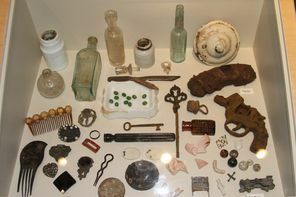 The dig turned up hundreds of bottles, including a hundred empty Champagne splits, as well as patent-medicine bottles. Hair combs, buttons, toys, beads, a gun and items from a Chinese laundry also were found. The dig centered on Sandpoint’s original town site on the Sand Creek peninsula. The early town had the Humbird Lumber blacksmith and machine shop. Another building was occupied by Chinese laborers. The site also included the city’s red-light district, known as the restricted district.